In a shallow bowl, combine all the ingredients numbered 2. Taste-check for salt. Cut the fillet into medium-sized pieces and make small gashes on them. Marinate with the marinade and set aside for 20 minutes. 1. Heat 1 tbsp olive oil/ butter in a pan. Add garlic cloves and fry for a few seconds. Next add mushroom slices and saute at medium-high for 3 – 4 minutes until mushrooms are done. Add spinach. Lower the heat to medium. Cover the pan for 1 – 2 minutes until spinach starts to wilt. Open the pan and season with salt and pepper. Add lemon juice. Stir and transfer to a plate. 2. In the same pan at medium or medium-high heat, add 1.5 tbsp olive oil. Fry the fish pieces on both sides until browned and done, about 4 minutes on each side. Take care not to burn garlic. (You can grill it instead). Place over sauteed spinach and mushroom and serve immediately. Enjoy! Instead of frying, you can bake it. Bake at 350 F for about 30 mts or until done, turning to the other side in between. 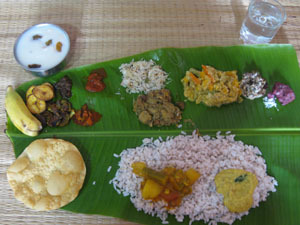 Such a droolworthy dish, cant ask more..Love to finish that whole plate rite now..